Professionals Traded Here! What Were They Seeing That You Couldn’t See? We've talked in previous articles about the fact that the best opportunity is found close to the edges of the market structure. Or another way to express the idea… "Confirmation is risk!" But again, let me come back to the comment provided in last week's article, "Confirmation is Risk! (Part 2)"
Standard TA won't make you money! You can't just do what everyone else is doing. You need to be smarter than the crowd. "It's not possible to enter there." "Professionals traded here. They didn't wait for confirmation. So what did they see that I was missing?" Curiosity and it's associated growth mindset will get you a lot further in this game than stubbornness and a fixed mindset. Let's look at a few examples, from different markets and timeframes as those offered in the earlier articles. We'll be limited to the Trading Timeframe (TTF) charts only. We're missing Higher Timeframe context and the ability to fine-tune our analysis via the Lower Timeframe price action. But in selecting these examples I've not just chosen the highest swing high reversal, or the lowest swing low reversal. Instead, I've chosen turn points which have TTF context and price action features that should make them "easier" to see. 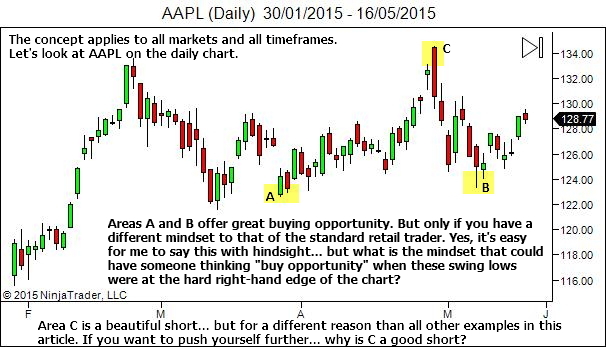 So look at the charts and see if you can identify reasons to provide confidence in entry close to the turning point. Don't worry about "how" you can enter there. There are many ways we can achieve this, through lower timeframe weakness and a YTC Price Action Trader entry trigger (Vol 3, Ch4, pp 70-98) or a YTC Scalper wholesale zone entry (pp 91-106). Or you can use other methods to build a position through multiple scale-in entries. For now though, don't worry about "how" you can enter. The first stage is being able to see the areas with hindsight… then being able to see them in real-time… and only then learning how to get in. Today… examine these charts and stretch your mind and your analysis to new and exciting areas of exploration… and simply see if you can identify reasons to buy or sell in these areas. This is not a "Holy Grail" approach to trading. Sometimes you can't get a position on in these areas. And naturally, sometimes they lose. But as discussed in the recent "Confirmation is Risk" articles (linked to above) the real advantage is that when you get it right, you've got an exceptional reward:risk opportunity. And that is the key to good trading. Review the above charts. Find something common amongst all examples which may indicate a reason to be seeking entry in these areas. I'll add my thoughts in the comments section of this article in a week or so. I'd like to share a reply sent to a reader who emailed me to say he tried this idea with two trades and they didn't work out, entering short both times at what he assessed to be a market top because he thought the market would go down. My first thought is that I hope you test all new ideas on a demo platform before applying then in live markets. It's a wise practice to implement, if you don't already do so. This concept is quite advanced. It's not something you can implement just because, as you say, "I was sure that Market would go down". It must be applied in the correct market context. And it requires significant skill in recognising exhaustion at the market edges. Success in this method comes through (a) exposure to the idea which you now have, and (b) a significant process of deliberate practice in reviewing and studying turn points in the market till you develop rules for when and where it is wise to do so. This article does not provide rules for how to identify which highs should be faded, although I suggest one criteria in the comments section for one way I do this. From a conceptual level, which is where the article focuses, the idea is still valid. Who was short at the market turn points? It's not the amateurs. It is the professionals. If you want to trade in the same places they do, you need to study the turn points to learn to see what they're seeing. Getting it wrong twice and then blaming the concept, is not the right approach. Study the actual turn points. Lots of them. Find common features that will allow you to develop some rules of thumb for when it is worth taking one of these entries. Because to do so, when you get it right, it can offer an exceptional R:R.
Hope that helps. I'd be happy to look at the Nifty charts and offer some comments, if you're interested in sharing them. Just add some text on the chart outlining your analysis and your entry/exit points. Excellent article. It is very interesting for personal growth, present their thoughts next week. Good idea. Awesome! I think addition of volume will make it easier to spot such opportunities. But in any case, in both A and B, the earlier swing high is close and so a potential for reversal is high. But sometimes a break out failure may prevent from getting in earlier. Thank you for this great article, I want to learn more about these setup and how to spot them. I think reason you want to take the trades price is losing momentum near the support or resistance. Great article m,looking forward to your thoughts on the examples. 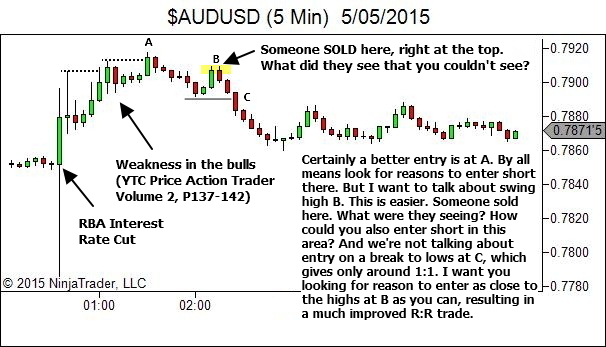 On the second chart (A and B) there are breaks and most of traders decided that prices are excellent entry points. I am new to trading and its your articles those show more lights on the market darkness. In all the above three charts, the wholesale traders identify the area of price rejection by previous bars ( that must be falling within their context). And if the price moves into those areas without the support of volume, they find weakness in the price movement. They assume that in the absence of volume, there will be weakness in the price movements (price rejection) in these areas and other traders will start to buy /sell in these areas to book profit. In the absence of volume and profit booking, the wholesale traders confirm that price will not move any further (above or below the area of rejection) and take early entry. 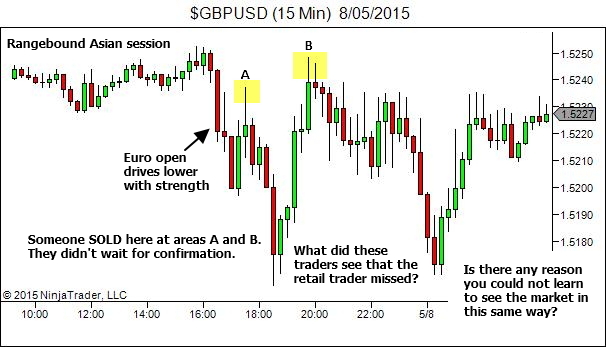 By the right analysis of price action, they confirm the price movement in advance and in the wholesale area itself. (this is my first post on trade analysis and forgive me for my poor English). Eagerly waiting for your analysis. Do you address tape reading (i.e. using the time and sales window) anywhere on your site? It’s an old way to trade and seems like nearly a lost art today. Do you think it’s still useful and do you know of any good material that explains how to analyze the tape? I don’t use tape reading. Some traders still swear by it so I guess there is value. I suspect it has more application with the slower and more methodical markets (S&P, bonds etc). (b) Price is moving into an area with an important structural feature off to the left, such as an area of strong supply/demand imbalance in the first image, areas of swing high/low congestion in the second image, and an area of post-news exhaustion in the third. Entry in the area will have other significant price action at it’s back. This acts as additional short-term (TTF) S/R which will help our trade in the event we’re a little early, often allowing us to work an exit or work to better our entry price. Example C in the second image is a little different, being a BOF setup rather than TST. In this case price has again over-extended on the TTF, but this time has moved beyond the prior significant feature rather than stalling before it. In many respects this one is even better than the others. The emotion is high with price gapping above multi-month highs. Watch for the gap open to stall and reverse. There is your entry short. There are other ways to enter near the extremes. But this is one of my favourites – TTF over-extension into an area of prior significant price action, entering when the move into the area has given all it’s got (eg. LTF stall or exhaustion). It’s no Holy Grail… but it’s entering in an area where it’s just plain dumb to be going the other direction… and the market is just ripe for a reversion to the mean (at the very least). Lance, I enjoyed how you made this post interactive. I tried to figure out why/how those locations were entries and I was right on only half of them. I learned from your follow-up but I’m not sure I could enter like that in live markets with much accuracy. I do like the locations you asked about, but I am wondering if attempting those kinds of entries (i.e. without confirmation) is good only in terms of Risk:Reward if they work, but sacrifices in terms of win percentage. Or are you pointing out that those are the best R:R locations which are also high percentage entries as well? I hope you get what I am asking. I ask because I have noticed many methods are promoted as having high win % but their R:R is always quite abysmal. Does one always sacrifice the other? You said, “I’m not sure I could enter like that in live markets with much accuracy”. It’s better that you say, “I’m not sure I could enter like that in live markets with much accuracy… YET”. You’re probably right that you can’t… yet. You haven’t learnt to see the areas… yet. And you haven’t built the skill… yet. It’s all a process of growth and development. Ok… to answer your question. As a general rule you’re correct that the Win% and R:R are inversely correlated. In completely random data this will be perfectly correct. Move your 1:1 targets out to 3:1 and your win% will drop from 50% to 25%. In trading it’s not a perfectly uniform relationship, as in this random data example, but it’s still useful as a general rule of thumb. In my experience though, with entries at the edges of the structure, and with some work at developing skill at this type of entry, I’ve found any reduction in win% to be negligible compared to the potential increase in Win/Loss size ratio. The question then is whether or not you’re willing to put in the practice. This type of entry technique will not suit everyone. But if the idea appeals to you, don’t discount it so quickly until you’ve put in some time (demo only). I have attempted few trades using this and I absolutely love the way things turned out.